I didn’t plan to be an entrepreneur. I started off as an engineer studying at Cambridge where I assumed I would graduate and work for someone else. But at some point, I realised that life wasn't for me. I wanted to do something more significant, something of my own. I was looking for the freedom to explore what I could do. I was better as a disruptor than I was at following someone else's lead. It took me a while to break out of the traditional mindset. When I did, I decided to go back to school. I enrolled in the Royal College of Art to study industrial design. It was a shock to my system. I had to unlearn the way I did everything and embrace the idea of always challenging the status quo. Entrepreneurship, design and invention became a bit of an obsession. My early inspiration was James Dyson, the inventor of the dual-cyclone vacuum cleaner. I wasn't so egotistical as to think I could ever match his level of success, but I wanted to create my own niche. I found my place in healthcare because of the many challenges and obstacles in this field. Healthcare is an exciting mix of human centred design, processes, equipment, and financial constraints. This is especially true in Britain's publicly funded system. I came up with a few inventions I patented, and tried to start a business for each of them, but the one that became the most successful wasn't the one I expected. As was the case with my other healthcare products, I created KwickScreen —portable, retractable, printable partitions—by asking questions. I reached out to contacts I had in the field, asking: What are the problems you're facing? What frustrates you? What gets in the way of delivering quality care, and of doing your job? My sister, Sarah, works in a hospital and told me one of her biggest frustrations is a lack of side rooms. There aren't enough private and isolated spaces to accommodate patients and practitioners. It seems the obvious answer is to build more rooms, but that's too simplistic—and expensive. Also, it takes away all the advantages of open-plan wards. As a manufacturing engineer, I wondered if there was a better way to organise hospitals. As an industrial designer, I asked whether I could invent something beautiful. Hospitals are all too often built to be functional, not pretty to look at, yet there is growing evidence to show that the environment has a significant impact on a patient recovery. I thought about the way factories work. Sometimes, like when you're building cars, you move the product from one tool to the next on a conveyor belt. If you're making a big product, like a ship, it stays in the same place. You bring the tools to it, instead. There was something to that idea. Being in a hospital can be traumatic, and moving a patient can add to that stress. KwickScreen takes this away by moving the walls instead of the patient. Transporting a patient also increases the risk of transferring infections. I invented KwickScreen to tackle these problems, but aesthetics were not an afterthought. In times of crisis, a soothing environment helps. 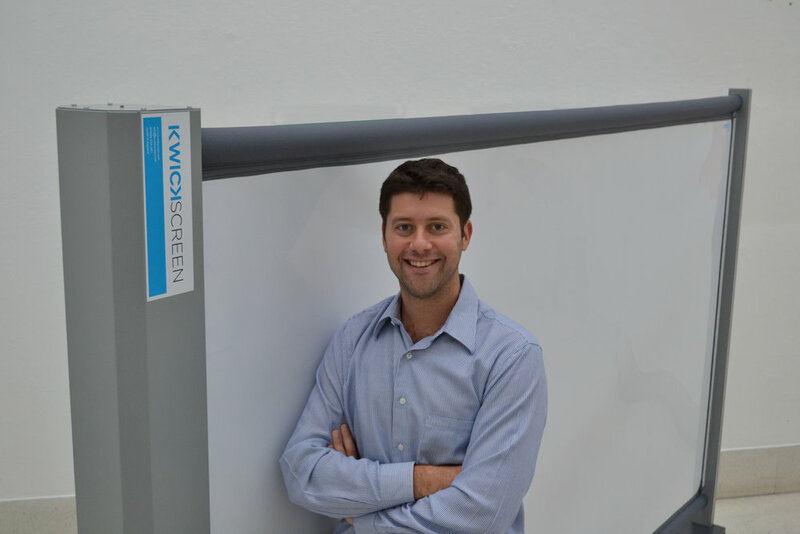 KwickScreen began as a school project. At the RCA, I learned to start with the impossible, then work backwards to a solution. I wanted to create a wall that could provide privacy to a patient and could appear and disappear. The first ideas were silly: holograms, lasers, and chairs that could rise out of the floor. Then I remembered a technology that allowed a rigid tube to become retractable. It's a glass fibre composite, similar to the kind used in sports equipment, such as baseball bats. It’s also used by the military and aerospace industries, but nobody was using this specific material in high-volume commercial applications. That got me thinking: What if I could use it to make a wall retractable? What if you could use it like a curtain, but could also move it around? You could create a side room anywhere. You'd have instant privacy. I started making prototypes. I discovered a roll-up material technology that was being used in space to help satellites grab hold of each-other. It helped that the company that made the material was in London, and I spent a lot of time there. But the truth is, it was just another student project. It looked good on paper, and the prototype worked, but it wouldn't go anywhere if I couldn’t put it into production. My entrepreneurial mind told me I needed help to go into startup mode. I then met Denis Ascomb, who became a good friend, as well as a business partner. Together, we took KwickScreen from the college classroom to the hospital ward. One of the biggest boosts to our company came from the Department of Health itself. We joined the SmartIdeas program, which gave us the money to build, and perfect, our screens. This wasn't seed money in the traditional sense. We weren't given funds to start a business. Instead, the National Health Service bought and paid upfront for a batch of privacy screens to test in hospital environments. We had no choice but to build our solution, and to get it right. Once we built our first products, we had to get them out into the field to see their real-world applications. We saw one screen used by the family of a dying man to give them some privacy as they stayed by his side for days. A curtain around a bed was too small to contain them, and spending his last days in an open ward was unacceptable. Staff paired the screen with a second one. Both were printed with nature scenes. The screens not only provided privacy but also created a soothing environment to counter the otherwise drab surroundings. The family was so pleased with the setup that, as a thank you, they donated money so the hospital could buy more screens. This gesture hit home and showed us the impact we could have on patients. This family benefitted so much that they wanted to ensure others could also get the same level of privacy—and comfort—they’d experienced. KwickScreens were also used in neonatal care units. When mothers breastfed their premature infants for the first time, they had to do it in the open ward. A screen provided privacy during this intimate and often emotional moment. But we also saw KwickScreen used in ways we had never envisioned. As security protocols became stricter for airlines, Geneva airport had a problem with their lack of private security booths at gates. The KwickScreen solved this problem perfectly as booths with their airport branding could pop-up anywhere. It opened our eyes. We had designed KwickScreen with some specific uses in mind, but people were finding different ways to use it. We've learned a lot from these early uses, and have sought ways to improve the product. The year after that, the company won the Lloyds TSB Award for best startup. These awards gave us credibility not only in the business community, but also in healthcare, where for an unknown company one of the biggest challenges of selling is having credibility. But the award that had the biggest impact on me was winning the James Dyson Award for industrial design—an award from my entrepreneurial idol. We got to incubate the company in his building. I often visit the Dyson School of Design Engineering at London's Imperial College. A lot of our employees including our CEO Alan Murrell, are graduates from Imperial College, and it’s thrilling to have a working relationship with one of my heroes. On the one hand, seeing how far we’ve come makes me happy—but on the other it’s scary. It’s daunting to know we have infinitely more people to reach and lives to impact. That’s a good challenge to have, I suppose. It’s the reason we keep innovating as a company. We still make the printed room partitions, but we've added a retractable whiteboard version and other products. We’ve also enhanced our screens to help patients with dementia - we can print scenes from the past to help with reminiscence. The possibilities are proving to be endless. As new hospitals are being built in Britain, we hear the same refrain: No more curtains! We want KwickScreen! Open wards are more cost effective. Why spend public money and private charitable donations building walls? As we move into the future, we’re going to help more patients around the world. Hospitals everywhere have the same problems as the NHS. We can help them with our expertise. After all, KwickScreen is all about industrial design. We still have a way to go, but, like our screens, we’re moving closer to our patients.